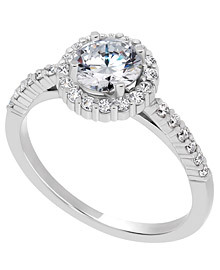 Our exquisite halo engagement ring is extremely popular for its radiant beauty. This setting can hold a center round diamond ranging from .46 carats to 1.10 carats. The side stones all have a color of G-H, a clarity of SI and a total carat weight of .52 ct.